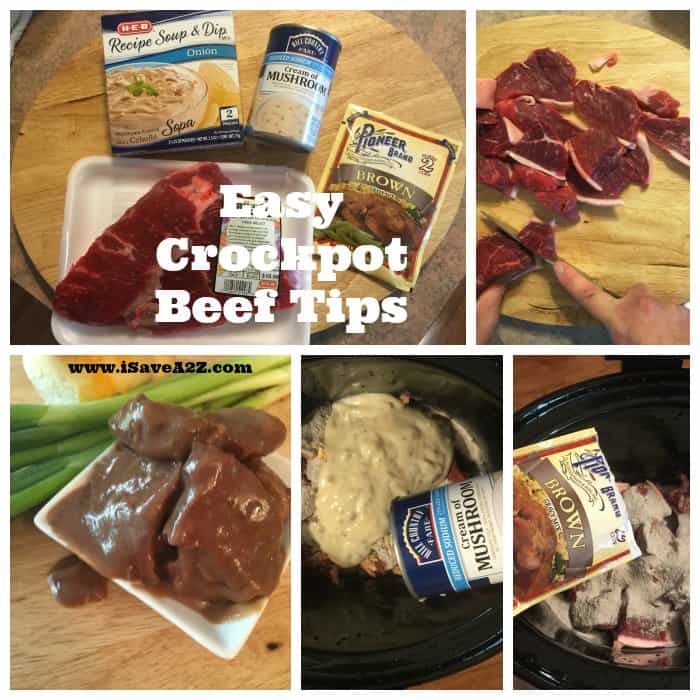 Our family really enjoys this easy crockpot beef tips recipe. We eat it often. Have you ever had days where you just didn’t know what was for dinner? Or maybe you just didn’t feel like making dinner? Yeah, this is the recipe for those kinds of days. This may be one of the easiest recipes you can whip together for your family. The trick is to have it well planned out ahead of time. Prepare yourself by getting all the ingredients you need at the store. This way you can add it to the crockpot and leave it until dinner time. Now you can serve this recipe over white rice, potatoes or even noodles. It really just depends on the time you want to spend in the kitchen. You can go all out and peel potatoes and boil them or you can whip together some instant potatoes in a few minutes. Did you know you can buy rice already precooked in the frozen section of your grocery store. Yeah! It takes only 5 minutes to heat and you don’t even need to take it out of the bag. It really doesn’t get any easier than that now does it? I still use my good old handy dandy rice warmer. Well actually it’s called an Oster Steamer seen here but it steams the perfect rice every single time. No more burned rice here! When you steam it, it’s so light and fluffy. I just love my steamer. It has a double decker layer too. I can add fresh veggies on the top and steam those at the same time as my rice. I’ve had mine for over 10 years already and it’s still going strong which is really surprising because I use it often. Tip: This recipe can be made with beef broth or water. I actually prefer it with beef broth but I ran out. It really does taste good both ways. Cube beef into cubes and place on them in the crockpot first. When it is done, serve it over white rice, potatoes or noodles and enjoy! By Jennifer on November 6, 2015 Crockpot, Main Dishes, Ninja Slow Cooker Recipes, Popular Posts, Recipes, Trending Topics.